Living in a big city can have some fantastic advantages, but sometimes it means having to make hard concessions when it comes to living area space. One necessary piece of furniture can make all the difference in your space. The sofa bed, as implied by the name, is a dual purpose furniture piece that gives you a place to lounge around during the day, and doubles as a bed at night. This piece is ideal for personal use in a studio type setting and also perfect for guest accommodations if there is no spare bedroom. This highly functional, dual-purpose piece of furniture has soared in popularity; the market is flooded with sofa beds that come in an array of shapes, sizes, materials, and prices. 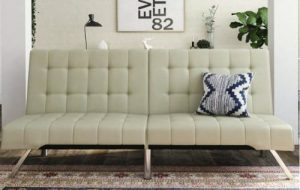 If you’re looking to modernize your space with this functional furniture piece you need to choose the best sofa bed and that can be overwhelming when you see what’s on the market. The Eugene is a modular convertible sleeper loveseat that is accompanied by ottomans that can be arranged so that two people can comfortably sleep on a queen size surface. The sleeping surface is going to be on the firm side, but this highly rated unit is perfect for a smaller space. One unique feature of this loveseat sleeper is the velvet upholstery is removable and washable in cold water. If you place this piece in a space that is prone to spills and stains the removable cover is sure to appeal to you. The 1-year warranty that accompanies this product is pretty standard, but I didn’t come across a common set of complaints that would indicate it’s a necessity. Another unique feature of this piece is that it is modular so it can be arranged to suit your style, décor, or space. It can be used as a bench, bed, or even a workstation at your discretion. This piece will be especially relevant to people with minimal floor space. With the Wade Logan Spirit Lake Sleeper Loveseat, you’ll find a click-clack mechanism that lets you easily switch among three positions: upright, reclining and flat. The arms of this functional loveseat are removable, and it has a couple of super handy zipper compartments for convenient storage. When this sofa is converted into a bed, it can accommodate two sleepers. 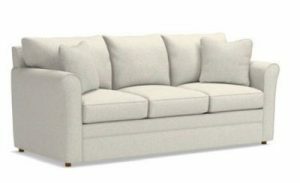 The Spirit Lake has aluminum legs and is made with premium fabric and comes in neutral or ash colored upholstery. This loveseat has a back made out of foam and it offers firm comfort. This particular product does not come with a warranty, but the manufacturer indicates that they will replace defective parts in a reasonable period of time. All things considered, this is a decent starter piece for young adults who don’t need a super-comfortable bed. This will also work well for people who host occasional guests at their place. If you’re into furniture without a lot of frills, this piece is streamlined and has a box-like structure. 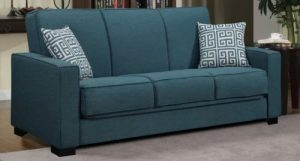 It fits most budges and with the gently tufted upholstery Spirit Lake loveseat can bring a modern look that and can be a centerpiece for a smaller space. 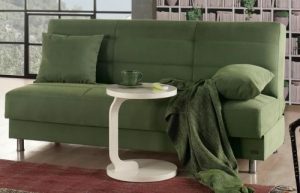 The microfiber upholstery combines with polyester and cotton to finish off with a solid green that blends especially well with indoor flora contrasted against brightly painted walls. The conversion mechanism from sofa to bed is much the same as a futon. It has a pull-back mechanism that is light enough to be managed even by children. The twin sized mattress is durable enough for regular use by a single person. The chrome finish on the legs does not impact the overall look of the piece. There is a super convenient storage compartment large enough to store sheets, blankets and pillows if you plan to use the sleeper in a guestroom. This item does not come with a warranty, but there are no major complaints from reviewers about durability or quality, defects or breakdowns. Rather, most users have positive praise for this piece remarking on its comfort. This can be a rare feat for a moderately priced sleeper sofa. The moss green shade lends this piece an informal style. It is easy to operate and well suited to interiors that receive lots of direct and ambient light. If you like the clean look of an arm-free, box-like design, the Demelo would be a good choice. It compliments any modern décor theme, and it is unique in that it has a movable third section that can slide along part of the base to a temporary shelf in the middle or on the far side. This piece of furniture will allow you to adjust the backs its two sections independent of one other. One person can be sleeping on one side and the other person can lounge back and watch TV, read, or just get some work done on the smaller side! You can conveniently place a drink, a remote control, your tablet, or your favorite magazine on the temporary shelf. 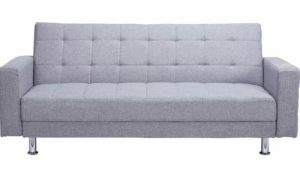 The sofa is constructed with high-density foam filling. You will find it in brown and black finishes with microfiber upholstery. Reviewers often remark of the high quality of this product. They contend that it is a solid piece, but it may be a bit too firm for regular sleep. This is going to be most suitable for people who will use it as a seating solution and the occasional sleeping solution. 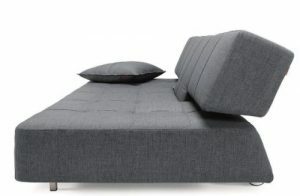 The unique feature of the Demelo sofa bed is it split the third section. This is a stylish solution for two individuals with different sleeping or working habits. The DHP futon is available in faux leather (black and vanilla) and linen (navy and grey) materials. This futon has luxurious upholstery and integrates nicely with its chrome legs. Its sleek aesthetic appeal is commonly noted by reviewers. Futons are conveniently and easily converted to sleeping, sitting, and lounging positions. This particular futon has a split back feature which allows you to operate two sides independently of one another. It has a foam and polyester seat to provide a somewhat firm feel. We found a few complaints about defective units and broken units, but the 1-year warranty should cover these problems. The Emily Futon matches a luxurious and modern room décor at a remarkably affordable price. This sofa bed is best suited for people who want to complete a stylish, contemporary game room or living space while maintaining a budget. The Woodhaven Hill Callie Sleeper sofa opens with an easy motion click mechanism to transform it from an upright sofa to a twin sized with a maximum capacity of 275 pounds, or two averaged sized adults. This sofa bed weighs less than 80 lbs. making it a perfect solution for people who appreciate the portability and fast assembly. The firmness of the seat is medium firm and it is filled with foam. Judging by user feedback, the product offers an acceptable amount of comfort and aesthetic appeal. The Callie sofa bed comes with an affordable price tag and with a 90-day warranty. This sleeper sofa is available in brown and grey and has microfiber upholstery. The twin sized Callie sleeper sofa is best suited for people who are looking to match a modern décor with a minimalist design. This sleeper sofa has a simple outward design but contains a durable kiln-dried hardwood frame. The piece sports a tempered steel spring mechanism that holds the foldout mattress. The upholstery materials are mildew resistant and the cushions have hypoallergenic fiber padding and HD foam top layers that are slightly firm yet very comfortable. The top cover is quilted for luxurious comfort, and the bottom is scuff resistant for maximum durability. The Modern Mono Sleeper Sofa comes with three feather-filled down pillows available in four finishes: Hart Sand, Packwood Grey, Packwood Orange, and Spitzer Grey. Buyers are a bit restricted in terms of customization, but its solid structure and positive user feedback make it good choice for modern households looking for a particular design. This furniture piece will blend into a space that has an informal style and setting. The look of this sofa is casual and easy going. The Ailith leather sleeper sofa has a medium soft cushion over top of spring seating. As a sofa, you can comfortably seat up to three average sized individuals. As a bed, it has enough room to accommodate two sleepers. The legs of this sleeper sofa are made out of kiln-dried hardwood ensuring a durable frame. This is an awesome feature for a lower cost piece. Be warned, this product does not come with a warranty and there are plenty of durability issues remarked upon by reviewers. However, if you need something for a smaller space, is low cost, and you need it now, this is a feasible purchase. 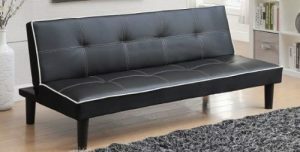 The Ailith Leather sofa bed stylishly clashes white piping with tufted black leather upholstery. This product is geared towards consumers who like to contrast multiple monochromatic shades in their décor, and wish to add a luxurious look without spending a lot of money. The Swiger uses high-quality fabric and comes in five different upholstery finishes. This product gives you some freedom to choose a solid color that matches your existing décor. The sofa occupies a small space so it can fit well inside of a crowded setting like a dorm room or a playroom. The material used for the seat fill is 1.8 pounds per cubic foot foam on top of pocketed coils. This helps the furniture to achieve superior conformity and comfort, especially when compared to the competition. The espressos colored wooden legs give this piece a traditional look and compliment the solid prints available. With two toss pillows included, this will appeal to the traditionalist style. 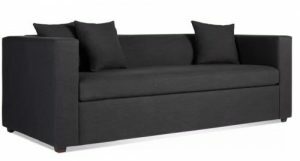 Most customers report being thrilled with the performance of this sofa bed, but there have been some recurring complaints of unnecessary gaps between the cushions of the seats and the arms. This might indicate imperfect manufacturing and design practices. This product is on the cheaper side of the cost spectrum, so it is not surprising for this piece to experience these kinds of complaints. To somewhat mitigate the manufacturing and design defects, the company does offer a 1-year warranty. The design of this piece lies somewhere between modern and retro. It has clean, bold edges with a slightly curved back. This sleeper sofa fits well with all but the sharpest décor themes on both ends of the scale. This sleeper sofa sports a traditional design and is made with polyester microfiber upholstery. The seat and back cushions are constructed from foam and covered with polyester. If used as a sofa there is space to seat three people. When folded out into a bed, it can comfortably accommodate two people. Reviewers described the seating and mattress as medium firm, but according to consumers, it softens with use. It does come with a 1-year warranty, which is standard considering the price. Digging a little further into the reviews you can find some common manufacturing defects reported, but the warranty it should give you some confidence while making the purchase. The sofa is available in solid shades of crimson red, mocha, sage, dark brown and black. The Minter has a classic appeal with its square-tufted upholstery and understated shape. This is particularly advantageous as it enables you to fit it into any casual setting ranging from a busy living room to a seldom-used guestroom. 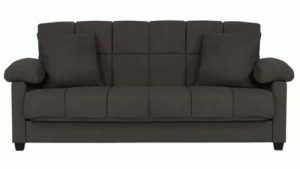 This sleeper sofa sport is a space saver with a relatively slim form when folded. It has pillow backs, contouring roll arms, box seats and complimentary accent pillows making your house look more like a home. Leah Supreme has an innerspring mattress that unfolds into a bed big enough to comfortably accommodate two sleepers. Leah Supreme offers dozens of styles and designs from plain to intricate which is sure to please your inner interior decorator. With this piece, there is a good chance you will find a product that blends well with your current décor. La-Z-Boy is assembled in the United States, and this well-known, high-quality brand comes with a Limited Lifetime Warranty. You shouldn’t expect or accept anything less at this price point though. The luxurious Leah Premier Supreme Comfort™ is a traditional pull-out sofa that will suit consumers who are looking for elegance in their living room without compromising comfort for themselves or their guests. 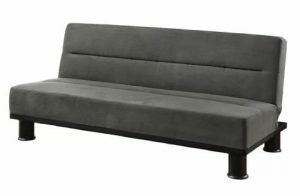 This low-key sofa bed with its tufted design and neutral finish appears to be another ordinary sofa bed on the surface. But, this sofa bed is easily transformed into a comfortable, deep, full sized bed. A great number of reviewers rave about the quality of quality sleep they’ve received on this bed. This furniture piece also offers a reclining position if you simply want to lounge about during the day. The polyester upholstery covers a surface with a pocket spring seat design for targeted back support. The sofa is ideal for extra support during extended periods of sitting. The sofa can hold up to 475 lbs. or about three average-sized adults. It has wheels on the back to be easily moved. This piece is on the expensive side of the spectrum, but the consumer feedback is unanimously positive while discussing comfort, utility, and durability. This is sure to be a solid investment if you can afford it. Traditional sofa beds require you to compromise on comfort and durability of either the sofa or the bed. You have to decide which component is most important. But, the Long Horn Deluxe Excess provides maximum comfort, functionality, and durability in both roles. The Stouffer is a corner sofa which can accommodate either a left or right-handed orientation. It unfolds into a very comfortable, foam constructed, queen sized sofa bed. You’ll find rich and supple genuine leather upholstery making this a luxurious seating experience as well. The square lines of this sleeper sofa give this piece a classic chic look. The Stouffer is made in the United States. It is truly a high-quality piece that you can count on being durable. This is definitely not your cheaper Chinese merchandise. Nothing symbolizes luxury quite like supple leather upholstery. 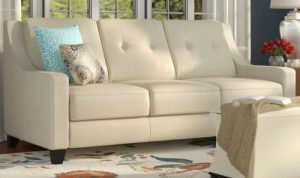 If you love the look and feel of leather furniture, then the Stouffer Sleeper Sofa may be worthy of your consideration. The Andover Mills Emmons Sleeper sofa is built on a solid wooden frame. It has foam filled cushions finished in polyester upholstery available in shades of spice, stone and lagoon. You can find abundant praise by consumers for high quality in all of the finishes. The flared arms complete a cozy and welcoming appeal of this convertible. The innerspring mattress provides somewhat firm support. It may not be suitable for everyday sleeping unless you compliment it with a mattress topper for extra plushness. This convertible is made in the United States, and there are no serious durability concerns in the user feedback across many reputable review sites. The casual yet clean flowing design leaves an immediately comforting first impression. It gives it just enough personality to compliment a shabby chic themed décor. The structure on which the sofa is built is referred to as its frame. Metal frames are readily available, but we find that the best sofa bed brands almost exclusively use kiln-dried hardwood. This hardwood material offers superior durability. If you find frames made from pine or other highly pliable woods, just know the price may be lower but your furniture probably will not last very long. The furniture piece needs its frame to be made from a durable material because it will be used daily. The daily wear and tear mean the fabric expands and contracts as it changes back and forth between its two forms. You’ll want to make sure that the edges are smooth because sharp or rough edges tend to snag your clothes and linens as you sleep or move around it. This might just be generally inconvenienced at best, but it could require time and money to fix rips and tears at worst. The most important component of the sleeper sofa is the mattress. 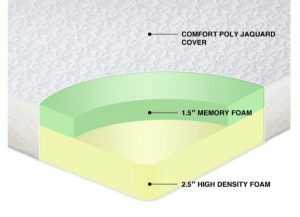 This feature is what determines the feel and comfort the product offers, just like it would for any other kind of bed. This structure is similar to that of an innerspring mattress. This bed/sofa combo has a support structure that consists of coils underneath a polyurethane layer. This will offer typical firm and springy support that an innerspring mattress produces. You’ll see the average coil density remains near 345 (plus or minus), and if you find a coil density twice as high, you can be assured that it is high quality. Memory foam is very popular because it conforms to the individual shape of your body. Memory foam gives you soft, pressure relieving comfort. This kind of support is especially well-suited to people who sleep in awkward positions. An air-coil mattress is an innerspring mattress combined with an air mattress. The spring support core is covered by an air mattress to offer somewhat better conformity without the use of foam. The thickness and density in which these materials are intended to be used have a significant impact on the performance, durability, and price of the furniture piece. Perhaps the most convenient of all the conversion mechanisms is the Clic Clac. All you need to do is push the back forward slightly to unlatch the locking system and unfold the bed into a flat sleeping surface. The most conventional operating mechanism for sofa beds is the lift and pull. This is the style of sleeper sofas typically found in futons and similar pieces. The mechanism operates by lifting the seat up vertically to release a lock and then pulling it down again to draw out the bed. The folding operating mechanism is designed for long term, regular use for sleeping. The mattress for this sleeper comes in memory foam and innerspring. It is folded out from the base in two motions. Frame sleeper requires you to pull forward its lower front panel. This unfolds its a-shaped base into a flat sleeping surface. A cantilever system is used to transform the bed back into the sofa. The corner design is quite stylish. It has an extra platform that pulls out from underneath the sleeper and it pups up into an alignment with an ottoman end. This furniture piece is effectively yields a double bed. Why do you need a sleeper sofa? Before you purchase a sofa bed you should consider its primary function in your house. If the piece is going to be used primarily as sitting furniture, you’ll want something that doesn’t sink and takes the pressure off your backside. In this case, you might want to consider a convertible that uses a foam mattress. Conversely, if the primary use of the sleeper sofa is for sleeping or accommodating overnight guests, you should consider a surface that can handle the pressure and body weight. An innerspring mattress might be best for this intended use in most cases. Although, if you like the look and feel of memory foam you can certainly find a functional piece with a memory foam mattress as well. Where to place the sleeper sofa? Don’t forget to consider the room you’ll be putting the sofa bed in. Aesthetics matter just as much as the physical dimensions of the product. A living room sofa should be visually attractive, comfortable, and have upholstery that blends with the decor of the rest of the room. If you’re looking to place a sofa bed in a den or study, you can forego looks in favor of functionality, practicality, and comfort. A lower cost microfiber sleeper that is very comfortable will suit the room just fine. If the room you’re placing this in is small, you should consider a futon or a loveseat that takes up less space. If size constraints are not issue, consider going for a traditional sleeping couch. You’ll have a much more comfortable bed that easily sleeps two people.